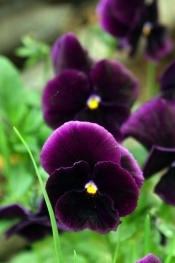 Velvety flowers in a rich range of colors have made pansy plants long-time favorites. 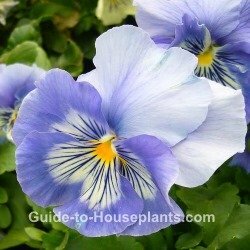 Easy to grow, pansies are well-suited for flower beds and borders, and make good container plants -- alone or mixed with other types of flowers. Those charming pansy "faces" are made up of 5 flat petals: 2 top, 2 side, and 1 lower petal. Typically, 2 or 3 colors are seen on each flower. The side and bottom petals often have contrasting blotches or veins radiating from the center of the bloom. Hybrids have brought us a wide variety of colors and patterns to choose from, including purple, blue, violet-blue, yellow, red, pink and white. Some purple hues look almost black. And some newer hybrids have solid colors. 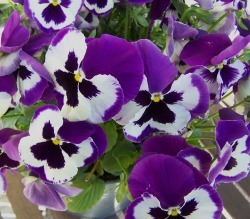 Packs of pansy flowers are easy to find in garden centers or online nurseries. Choose a plant with plenty of buds that are just beginning to open -- a sign of a young, vigorous plant. Pansy is a biennial, although it is usually bought in bloom, treated as an annual and tossed in the compost bin at the end of the season. You can keep it indoors to extend the bloom time. Biennials have a 2-year life cycle. Grown from seed, they produce foliage the first year, then flower, set seed, and die the second year. Many newer pansy hybrids have been bred to bloom the first year. Low and compact, pansies are ideal for containers. If you don't have a spot outdoors, put pansies on your sunny windowsill. Pinch off flowers after they fade to promote more blooms. Keep the soil moist at all times, but don't overwater. Dry soil will cause flowers to fade quickly. If you're watering regularly and the plant wilts, root rot or stem rot is likely. These are the most common problems with this plant. Got a reluctant bloomer? 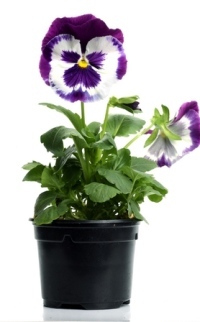 Lack of sunlight or too-high temperatures will make pansy plants fail to flower. Yes, pansies are a little wimpy. Shade them from direct sunlight during the hottest part of the day. Light: Bright light to full sun. Pansies like it cool, so if you live where the summer is hot, keep your plants in partial shade. Water: Keep soil evenly moist, but not soggy. Humidity: Moderate (around 40-50% relative humidity). Place pot on a tray of wet pebbles to increase humidity. Don't mist them indoors because pansies are susceptible to powdery mildew. Temperature: Cool to average room temperatures 60-75°F/16-24°C. If you grow them outdoors, they're winter hardy to USDA Zone 4. Pansies like cold better than heat, even tolerating a little frost. Propagation: Sow pansy seeds in early spring. Drop them on top of moist potting mix, then barely cover them with mix. Seeds will germinate at room temperature. Don't expose them to sunlight until they've sprouted.